We specialise in achieving that designer look without the designer price. 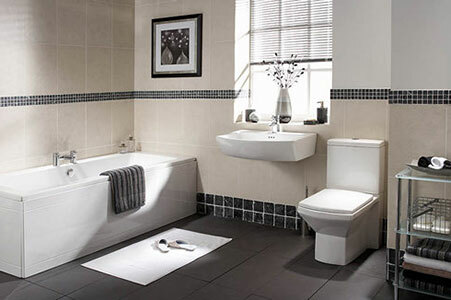 At Lenzie Plumbing we pride ourselves on being able to create a bespoke bathroom that will live up to your every expectation and come in at a great price. Our engineers will undertake refurbishment, repairs, and the installation of toilets, baths, showers, and all related bathroom work. We will always try to ensure minimum disruption and we will leave your premises clean and tidy following our visit. We are so confident in our workmanship and your satisfaction that we will give you a piece of mind full written 12 month guarantee. All of our engineers are fully qualified and experienced to tackle any type of plumbing or heating problem you may be struggling with whether it be in the home, an office or commercial property. We can have a Glasgow based plumber out to see you in no time at all! We can handle all types of plumbing, heating and boiler work. Each of our team have an area of expertise such as emergency plumbing, central heating service, boiler repairs, bathroom or kitchen installations and pipe replacements. No job is too big or too small for us. But we take a pride in every job we do. And it gets treated with the same importance and urgency. As a family run business, we take pride in the quality of our work and “fixed price plumbing” scheme. We serve all areas of Glasgow and outlying areas including: – East kilbride, North Lanarkshire, South Lanarkshire, East Renfrewshire, Renfrewshire, Ayrshire and Paisley. So if you require a local plumbing job from a quality local plumber. Contact Lenzie Plumbing today!